Dental implants are not for everybody. Some people just don’t like the idea of holes being drilled into their jawline, or they may not be suitable candidates for that procedure. If that is the case, then there are alternatives to dental implants available. If you just need a tooth here or there replaced, then a fixed bridge, supported by supporting teeth, can be a great solution. It relies on the stability of the teeth on either side of the gap to support the bridge. Now this does require that healthy teeth be ground away a little bit to make room for the bridge. The fit has to be a perfect one if the bridge is to stay in place, so healthy teeth need to be chipped away at to support it. Patients should note that a bridge supported by teeth is not likely to last as long as one supported by an implant. 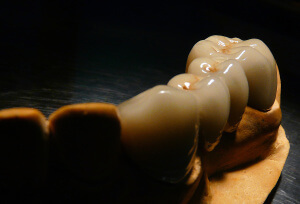 Another type of bridge is a resin-bonded one. It is particularly useful for front teeth, where grinding and chewing is not as common, so the teeth don’t need to be quite as strong or secure as back teeth would need to be. This bridge comes with wings on either side that can hook onto the adjoining teeth. The benefit of this method is that no grinding is required. It might not be quote as strong as a fixed bridge, but it does look more natural than dentures. The least stable but also least invasive replacement method is to use removable dentures. You can have a single tooth denture inserted between healthy teeth, but you should now that it isn’t very secure and that it may cause problems with speech or eating. Removable dentures can also serve as a way to replace multiple teeth at once. A row of dentures can be inserted, but once again the results are unstable. It does tend to be the least expensive replacement method, but it is also slightly unnatural looking. If you need to replace all your teeth, but you don’t want to go the implant route, then a complete removable denture is pretty much your only option. There are no other teeth to latch onto, so nothing else is viable. The dentures wont cost much, in most cases, but they can be uncomfortable to wear. They also reduce the full taste of food and can cause clicking sounds in the mouth. They are certainly an imperfect solution, but they could be the best choice for those who cannot take implants. These options should only be used if implants are too expense for you or if your mouth cannot tolerate implants. Going with an implant is the better route, as it provides a longer-lasting solution and will give you better results. But many people live fairly well with these tooth replacement methods. You should consult with your orthodontist or dentist before making your decision, as you want to be sure you are making the best choice for your situation.